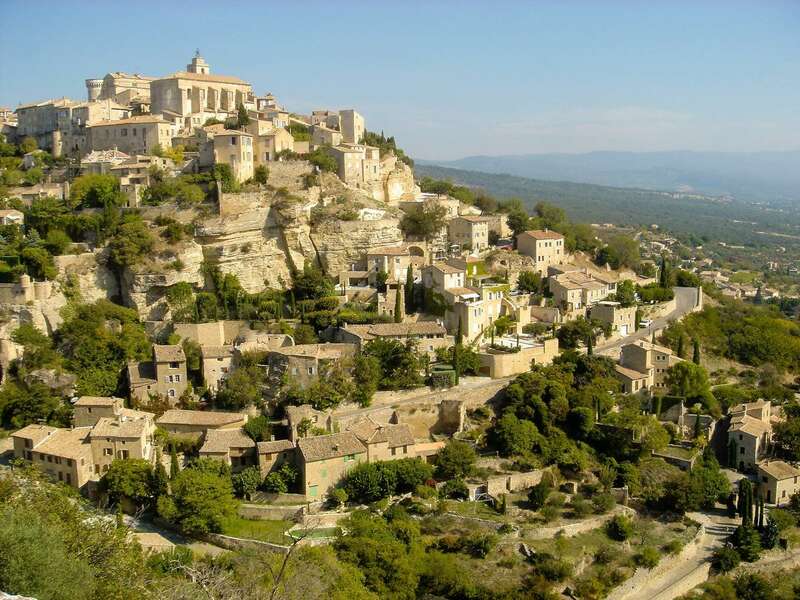 The Luberon’s best known village is probably Gordes, rising majestically from the valley floor to its dominant position. It is also the most photographed village, especially the amazing view of it on the approach road. Being so beautiful, Gordes is heavily visited in summer so it’s best to go early or late, to explore its tight streets and cobbled alleys, many restaurants and cultural events. The village is piled high in a spiral with the Renaissance chateau at its peak, and all the grand architecture is in the local honey-coloured stone. The castle in the centre of the village is perfectly restored and marries its turbulent 11th century origins with a rebuild in the 1500s. It has a fantastic fireplace which was classed as a Historic Monument even before the castle was. Gordes Castle now houses both the town hall and a museum dedicated to the Flemish artist and Gordes resident Pol Mara. In a fortified village like Gordes space is limited…unless you start to burrow into the hill itself. Starting in medieval times this is just what happened, under Gordes is a whole universe of cellars and caves that used to house workshops, oil mills, bread ovens, etc. Today you can visit a small section of this underground world, following years of restoration work, under the Palace of St Firmin in Gordes, over many levels linked by passageways. In August Gordes hosts various outdoor jazz and classical concerts in this amphitheatre setting which gives you the feeling of hanging in space outside the village walls, with spectacular views of the surrounding countryside. A couple of miles from Gordes is the idyllic setting of Senanque Abbey, an active abbey with a population of monks. This may well be the most photographed abbey in France because from mid-June to early August the lavender field in front of the abbey creates the most glorious photo opportunity. Just outside Gordes is the Village des Bories. A borie is a stone shepherd’s hut, built like a dry-stone igloo, with flat stones and no mortar, absolutely synonymous with the Luberon region of Provence and evocative of a time when only sheep and goats roamed these hills. Bories were used as shelter for shepherds, livestock, or tools. The Villages des Bories is an agglomeration of these constructions, whose origins are mysterious. Some think they date back 1500 years, some think less. The uncertainty of their age and purpose adds to the pleasure of a visit. If you want a gastronomic (and expensive) dinner, there is one luxury address in Gordes, the Bastide de Gordes hotel. Confusingly it has 3 restaurants, the best of these is called Peir / Pierre Gagnaire TT (more confusion). Perhaps it is enough to say that the executive chef Pierre Gagnaire has 3 Michelin stars in other restaurants and in 2015 was voted best chef in the world by his peers. The Bastide de Gordes has a wonderful big terrace with view to the west. A delightful contemporary bistro with Mediterranean home-style cuisine that does not give you the feeling that you are a tourist. It’s small with outside tables right in the main square of Gordes by the chateau, and you should book ahead. Strong on meat – the lamb and the duck with chanterelles especially. Dinner menu for 37 euros. This used to be Club Tartares, and it still does a tartare menu, with all sorts of varieties on the classic steak tartare, even fish tartares and a vegetarian tartare. Now the restaurant has also added tapas, so it is no longer a one-trick pony. It’s a ‘cool’ place by Gordes standards, with something of the vibe of a beach restaurant, and it is one place where you can turn up for dinner late and still be served. It’s cosy, inexpensive, friendly, and usually full because it’s the place where the locals eat. There can be no higher praise than that. Food ranges from tapas, charcuterie and salads to steak and chicken curry. La Trinquette has a lovely terrace but it also has one of the best-placed tables in Provence, squeezed onto a tiny balcony up high with magnificent views to the west. Two courses at lunch for 17 euros. Not a restaurant, just a bar, but a Gordes institution. Le Cercle Republicain is the locals’ bar, an island of authenticity where workers prop up the bar and discuss their day. Once there were thousands of these Cercles Republicains all over France, their purpose to uphold the principles of the French Republic. Now there are just a handful. It’s somewhere you pay normal prices, but you still get the million-dollar view over the valley, especially from the little balcony suspended high over the world.